Investors interested in gold, silver, and platinum can add exposure to their portfolios in a variety of ways. Precious metals deserve a spot in any balanced portfolio. As a hedge against the possibility of rampant inflation or currency debasement, it's hard to find a better asset class. If you're looking to add precious metals to your portfolio, or build a portfolio based strictly on precious metals, you have many options to choose from. Let's take a closer look at precious metals in general, and then how to add precious metal exposure to a portfolio. Precious metals are defined by their rarity and their tendency to be non-reactive, which makes them expensive and limits their industrial use. There are more than a dozen different precious metals in total, including mercury, beryllium, and indium. However, for investing purposes, there are really only three worth considering: gold, silver, and platinum. Gold is the ultimate precious metal. Its demand is well-established, yet it has virtually no industrial uses. Silver is less rare, and is often used in electronics and automobiles. Platinum is more rare than gold, but has a fair amount of industrial use, and its status as an investment vehicle is less established. In general, the price of all three metals will move in tandem, but there are some occasional swings. Silver and platinum are more susceptible to shifts in the global economy, while fears of forthcoming inflation can spark moves in gold. Consider the recent performance of the most popular precious metal ETFs, ETFS Physical Platinum Shares (NYSEMKT:PPLT), SPDR Gold Shares (NYSEMKT:GLD), and iShares Silver Trust (NYSEMKT:SLV). Investors interested in the metals can purchase them directly, buying physical bullion and storing it in a household safe or depository. Gold, in particular, is easy to purchase, with coins and bars available in all manner of weights. Investors can turn to specialty dealers like Kitco, or even online auction sites such as eBay. But taking delivery of physical bullion is not without its problems, and investors will often be forced to pay more than the spot price for their metal. 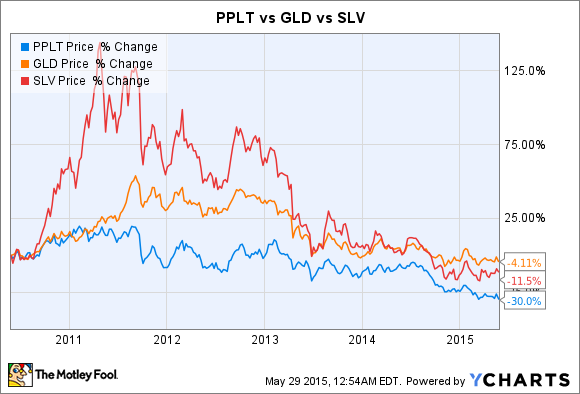 The aforementioned ETFs -- PPLT, GLD, and SLV -- allow investors to "own" precious metals without actually owning them. To be clear, owning a share of GLD or PPLT is not the same as literally owning the metal, but the value of all three ETFs is tied directly to the market price of the precious metals they represent. All three ETFs are physically backed -- that is to say, their shares represent some percentage of a large amount of the metal stored in a warehouse. Alternatively, investors can purchase shares of a gold, silver, or platinum mining company. Like a physically backed ETF, it's not the same as owning the actual metal, but the financial performance of miners is linked to the price of the metal they produce. There are many different firms to choose from, and some large miners produce several, but there are also pure play miners dedicated almost exclusively to their respective metal. For gold, there's Goldcorp (NYSE:GG), one of the largest pure play gold miners in the industry. As part of its corporate strategy, Goldcorp does not hedge, which ties its financial performance more closely to the underlying price of gold. 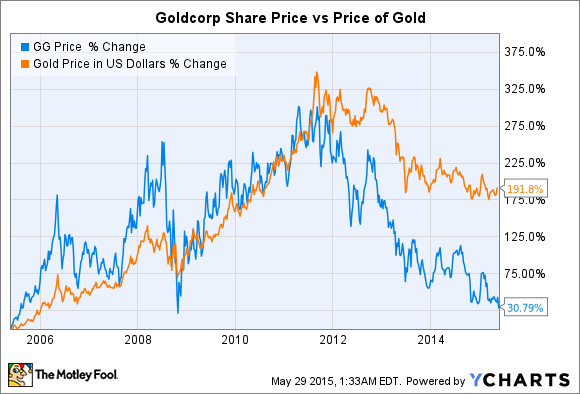 That's proven to be devastating in recent years (Goldcorp shares are down more than 50% in the last three years alone), but during the brief gold bull run from the beginning of 2009 to the summer of 2011, Goldcorp shares rose nearly 70%. Silver Wheaton (NYSE:SLW) is one of the largest silver companies in the world, both by market cap and proven silver reserves. Silver Wheaton isn't a traditional miner, but rather a streamer -- it purchases the rights to the silver produced by other miners at a fixed, upfront cost, then takes delivery of their silver as they mine it, and sells that silver at the market rate. Other miners (including Goldcorp) use deals with Silver Wheaton to hedge their silver risk -- owning Silver Wheaton allows you to capture the potential upside. 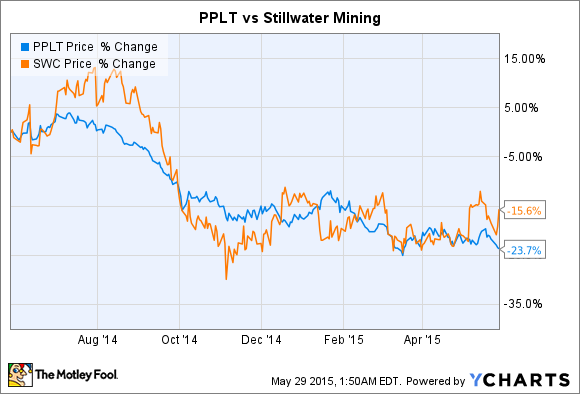 Finally, for platinum, there's Stillwater Mining (NYSE:SWC). The company is relatively small, but a major player in the platinum market. Most of its platinum production comes from its mines in Montana, but it also engages in platinum recycling, purchasing and extracting platinum from used industrial sources, primarily catalytic converters. Stillwater also produces related metals (notably palladium), but its share price has tracked closely with the price of platinum itself. Unlike physical bullion, miners carry real downside risk -- political turmoil, poor management, and labor strikes can take a toll on a company's financial performance, even if precious metals themselves are in a bull market. But mining stocks offer yet another way for investors to access the precious metal market. A combination of mining stocks, physical bullion, and backed ETFs, can add precious metal exposure to any portfolio. Metals ETFs: Going Out of Style?